Please don't ask me about that MacroMarkets Oil Down Fund (DCR) - I have no idea what's going on with it. It came out as number one, so it's in the top spot. Numbers two and five, however, I like a lot. 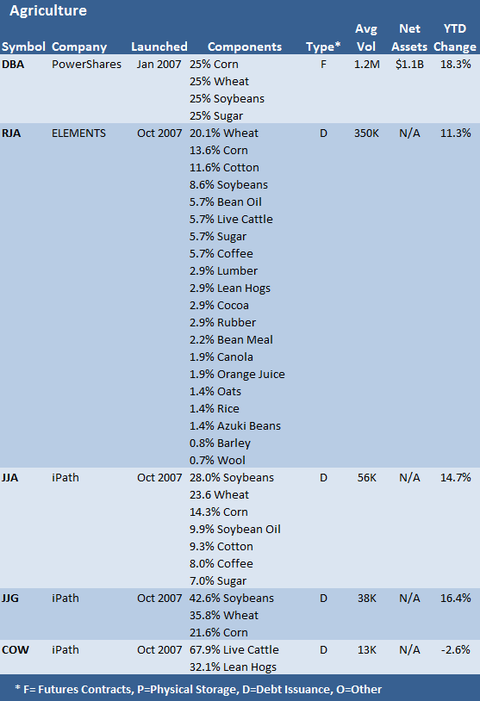 Mutual funds, exchange traded funds, and exchange traded notes based on a commodity index are shown below. All of the remaining tables are ordered oldest fund first, newest fund last. 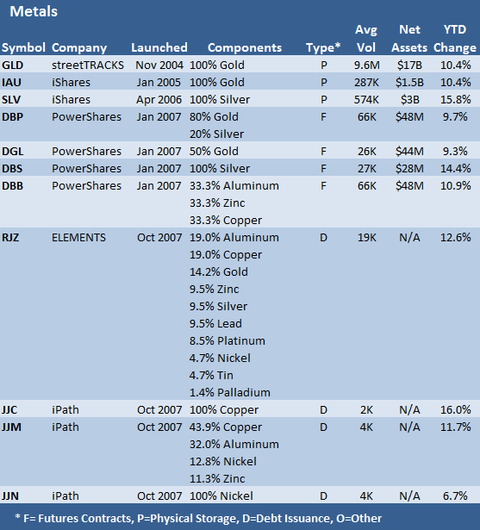 The Dow Jones AIG Commodity Index, the basis for both Pimco PCRCX fund and the iPath (NYSEARCA:DJP), has been the top performing commodity index so far in 2008, though it is not clear how the Pimco fund has outperformed its index by such a wide margin. 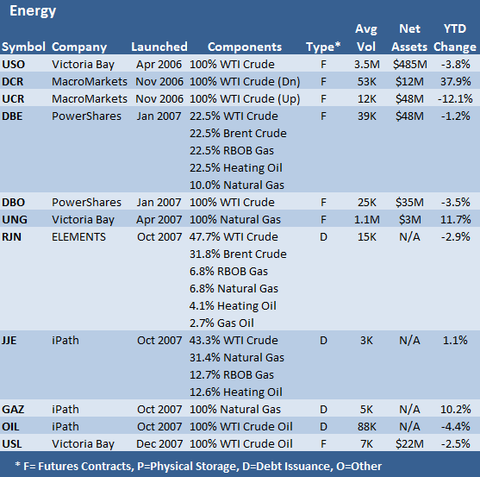 Energy funds are shown below. Again, don't ask me about the Macromarkets products. Note how the "early bird gets the worm" above with the Victoria Bay USO ETF and the streetTRACKS (NYSEARCA:GLD) ETF below. The streetTRACKS ETF beat the iShares (NYSEARCA:IAU) ETF by a month or so, yet it's got 15 times the trading volume and 33 times the assets. 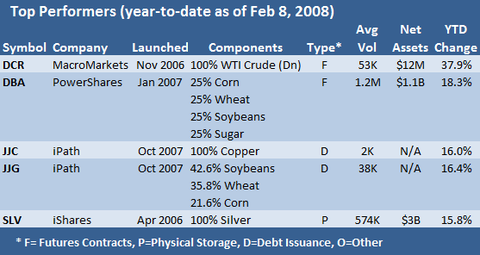 Of course in the metals, copper and silver are the stories so far in 2008. Copper?? Isn't Dr. Copper supposed to be predicting the future of the global economy? You wouldn't know it to read any financial newspaper, but Dr. Copper thinks the prospects are quite good. If anyone knows of any other offerings, let me know. 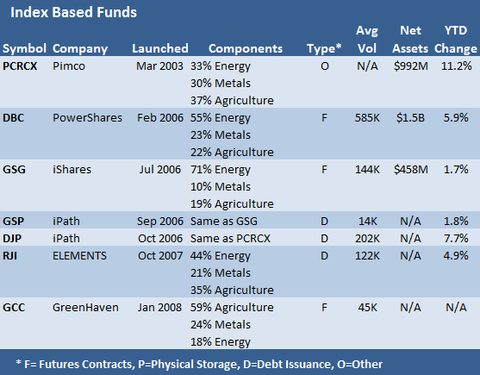 I think the above list is complete save for a very old Oppenheimer fund [QRAAX] that has some ridiculously high loads. Editor: See also our full listing of Commodity ETFs and ETNs.